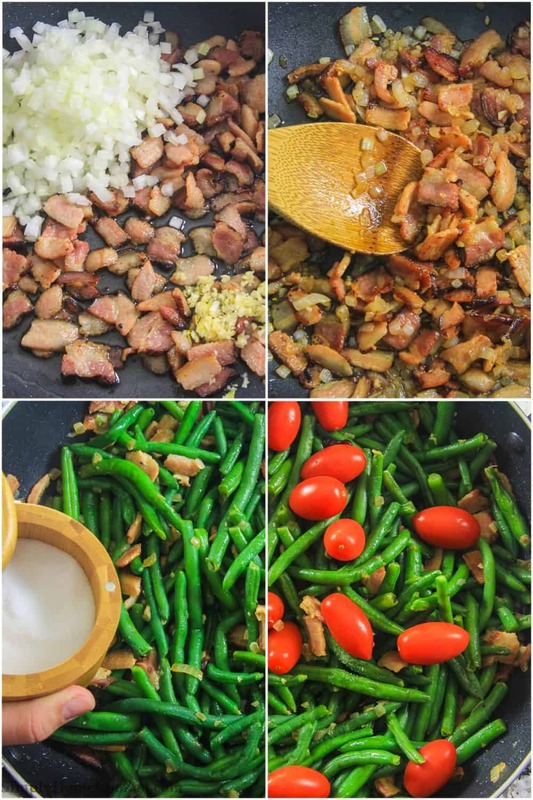 Sauteed garlicky green bean salad with smoky bacon and cherry tomatoes. This green bean salad recipe is guaranteed to be a crowd pleaser at any gathering. Serve it with my Thanksgiving Turkey recipe and easy turkey gravy! This recipe was originally posted October 9, 2015, we’ve tweaked it a bit since then. This post may contain affiliate links. Read my disclosure policy here. 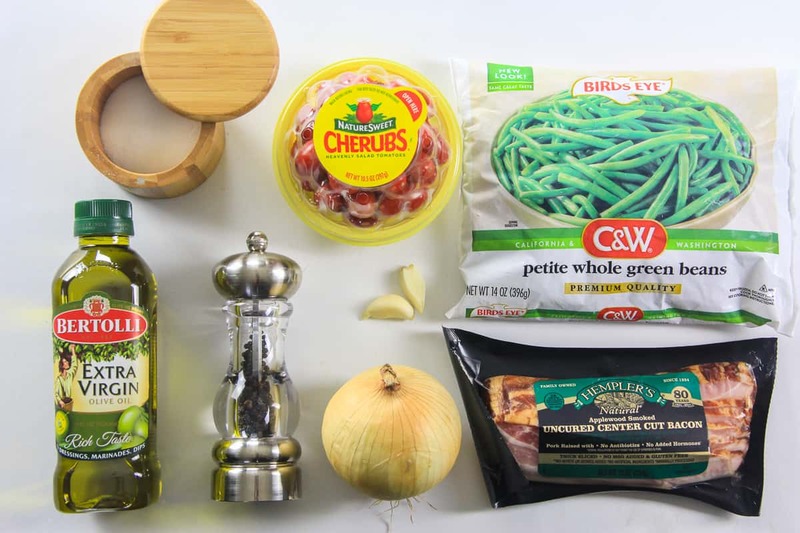 Here’s an overview of how to make my favorite green bean salad. You’ll find the complete recipe card with detailed instructions below. 1. Chop the bacon and onion, then mince the garlic. 2. In a large pan, cook olive oil and bacon over high heat. Or until the bacon is golden and slightly crispy. 3. Add the onion and garlic and cook on medium-high heat until the onion becomes translucent. 4. Add the frozen green beans and stir until they soften. 5. Add the salt, pepper, and tomatoes. Stir for another 2-3 minutes and remove from heat. Don’t over stir, stirring too much will cause the tomatoes to become mushy. Do I serve green bean salad hot or cold? This is entirely up to your preference. My family and I prefer to eat it hot off the stove. We love how the hot salad really brings out the sweet flavor of the onions. However, this salad also tastes just as delicious cold! You can refrigerate it and eat it throughout the week. What goes well with green bean salad? 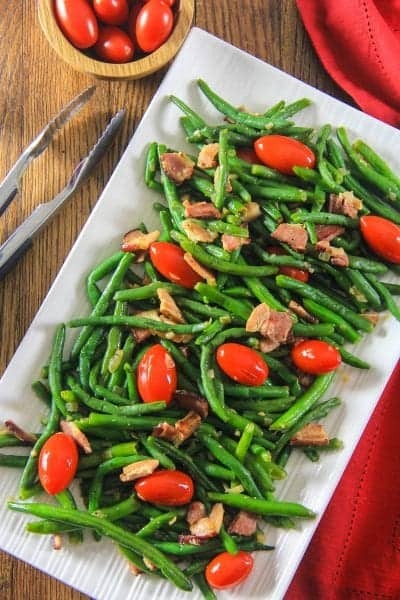 This is a classic American dish, so cookout and BBQ dishes go well with my green bean salad. Serve it with burgers, chicken, or even pork loin. Chop the bacon and onion, then mince the garlic. In a large pan, cook olive oil and bacon over high heat for about 4 minutes. Or until the bacon is golden and slightly crispy. Add the onion and garlic and cook on medium high heat until the onion becomes translucent. Add the frozen green beans and stir until they soften. About 5-6 minutes. Add the salt, pepper, and tomatoes. Stir for another 2-3 minutes and remove from heat. Don't over stir, stirring too much will cause the tomatoes to become mushy. Here are some more great salad recipes. Is it better to serve this salad cold or hot? Hi Inna, we usually make this and eat it hot and prefer it hot. But you can eat it hot or cold.